I am obsessed with steamed corn. You take how Oprah feels about bread, and multiply it by three, and that is how I feel about corn. Those crisp, sweet kernels of sunshine are the epitome of good eatin', and it needs very little in the way of preparation. 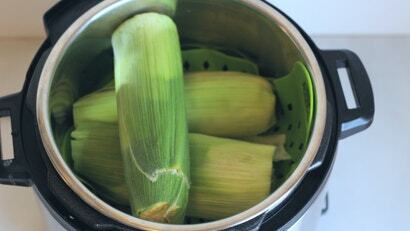 If I’m not grilling it — which is often the case due to my lack of backyard and grill — I steam the cobs in the husk. Steaming makes the kernels pop with fresh, corny flavour, and it makes the silk easy to remove, which is really all you can ask of a corn cooking method. Steaming in a big pot isn’t hard, but it’s a pot you have to watch, and there are two other, more hands-off approaches you can take.